Summary: Although the first examples appeared as recently as 2003, the FEA intermodal flat wagon has proved popular with a variety of operators and over 900 were in stock by 2008. As well as carrying ISO containers the type is also used for infrastructure-related roles, for which specialised modules are fitted. History: All FEAs (except the FEA-Cs) are built to a spine-type design, with the container mounting points carried on substantial outriggers. Most are operated in twin-set pairs, with a bar coupling between the two and conventional drawgear on raised headstocks at the outer ends. All pairings to date have been of consecutively numbered wagons. The first arrivals were the FEA-A twin set wagons for GB Railfreight (GBRf), ordered in September 2002 for use on new Medite Shipping Company services from Felixstowe to Hams Hall and Selby. The wagons were financed by HSBC Rail and built by Marcroft Engineering at Stoke, the first being delivered in January 2003. Mounted on Y33 type bogies they were painted in a distinctive mid blue livery with yellow ISO fittings. Although privately owned, the wagons were numbered in the railway-owned, air-braked series as 630001-630044, the 61xxxx and 62xxxx series already having been used for rebogied Freightliner flats. Initial design code was FE003A although all had been modified to FE003B by 2008. Arriving a few months later were the first of a large batch ordered by Freightliner, also financed by HSBC Rail. These wagons differed from the first batch in being mounted on Y25 bogies and they were built by Greenbrier at its Wagony Swidnica factory in Poland (as were all subsequent FEAs). Designed to carry 8�6�� containers within the W6A loading gauge, an initial batch of 134 wagons was ordered with the total expected to reach 400. These were intended to allow for traffic growth rather than to replace the ageing fleet of FFA and FGA container flats. The first deliveries took place in March 2003 and apart from the first pair, utilised channel tunnel freight services. The TOPS code of FEA-B was assigned along with design code FE004A. The wagons were painted in Freightliner green livery with the company logo and numbering panel carried on the sides of the central spine. Because this made the numbers hard to see when the wagons were loaded, the last digits of each wagon's number were repeated on the sides of the headstock. Wagons 640001 to 640099 had the last two digits in black, while up to about 6401xx had the last three. Subsequent wagons had the last three digits but in a much easier to see white. In all cases the numbers were in individual boxes, and this feature was carried on most FEAs for other customers. Deliveries of the next batch (numbered from 640135) started in late 2003. A second batch of wagons for GBRf entered service later in 2003. 50 wagons were initially ordered and these were numbered in another new series as 650001 to 650050 with a TOPS code of FEA-C and to design code FE005A. Although again built by Greenbrier in Poland, these wagons were to quite a different design, more like the existing FSA/FTA type. Compared to other FEAs, the wagons had smaller headstocks and continuous solebars. In service, this batch was used alongside the earlier GBRf wagons. 2004 saw many more FEAs make the journey across from Poland. As well as the ongoing delivery of the large Freightliner batch, twenty were ordered by Balfour Beatty and given the seemingly odd numbers of 640501 to 640514 (twins) and 640571 to 640576 (singles). 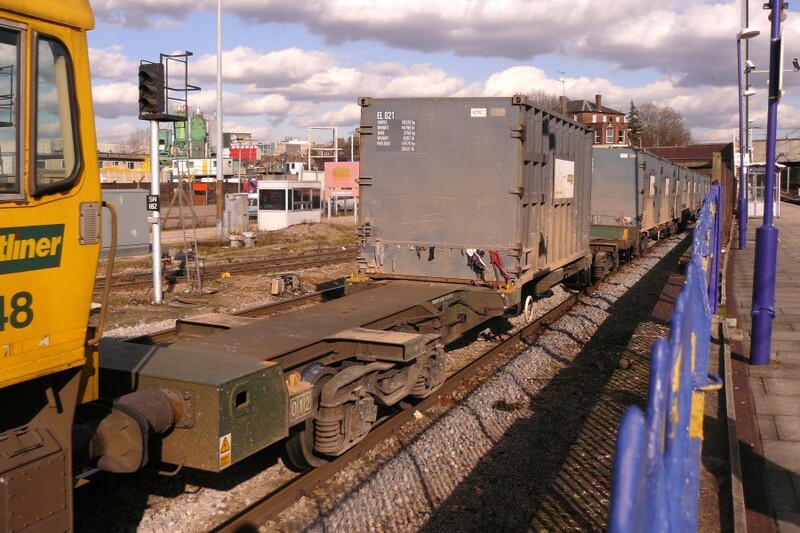 These wagons were for use with Balfour Beatty�s New Track Construction (NTC) machines, and they were fitted with specialised modules to handle sleepers (501-514) and track laying equipment (571-576). The modules were mid-blue while the wagons themselves were light blue. The batch spent some time at Crescent Wharf, Peterborough, being fitted out for their role, during which time the design codes of some were changed from FE004C to FE004F and FE004G, the TOPS code remaining as FEA-D. In service, the sleeper carriers (501-514) are most often used with equipment carriers 640573 and 640574, while the other equipment carriers tend to work with KFA sleeper carriers or other types. A third batch for GBRf started arriving in October 2004, comprising twin sets 640601 to 640630 (FEA-B to FE004D) for intermodal traffic and single wagons 640631 to 640693 (FEA-S to FE004E) for infrastructure use. Some of the single wagons saw use on container trains at first, while others were fitted with flatbed or dropside open modules. These modules were known as �Salmon� and �Tench� respectively as they produced wagons of similar configuration to earlier designs that carried these names. The Salmon-fitted FEAs were most commonly used to carry track panels, while the Tench were treated as general materials carriers. A batch of single wagons ordered by Freightliner arrived later in 2004. 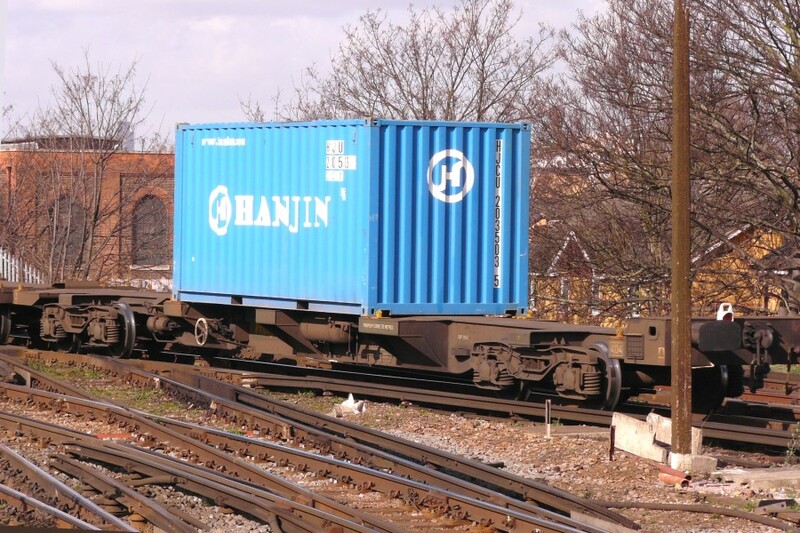 As with the GBRf examples, these were intended for infrastructure use but some were initially pressed into intermodal service, including on the �binliner� domestic waste container services operated by Freightliner Heavy Haul. Deliveries ran into 2006 and the eventual total was 66 wagons numbered 641001 to 641006 to design code FE004H and TOPS code FEA-E. Examples fitted with flatbed modules for carrying track panels were recoded FE004L, while others carried �Tench� modules. In 2005, the main Freightliner order for twin sets was extended by a further 100 and wagons up to 640500 were delivered in the first half of the year. A follow-on order for 34 wagons took the numbers 640701 to 640734 and these entered service in 2005 and 2006. Two new customers for FEAs in 2005 were Network Rail and Jarvis Fastline. The former took 50 single wagons in the summer as 642001 to 642050 (FEA-F to FE006A). Painted black these were for use in railhead treatment trains and carried blue, specialised modules including water tanks and generators. They were also fitted with mulitple working cables to allow operation with a locomotive at each end, and spraying equipment mounted on the underframe. The wagons operate in pairs and are stored each year between December and September. Jarvis Fastline ordered 24 wagons to be formed in twin sets for new intermodal services between Tilbury and Doncaster. Delivery occured over the winter of 2005/2006 and the wagons were numbered 643001 to 643024 (FEA-B, FE007A) and painted in a grey livery. GBRf was yet again buying FEAs in 2006, this time in connection with their contract to provide trains for Metronet infrastructure renewal work on the London Underground Ltd (LUL) network. The order called for 22 FEA-S (single) wagons, 14 of which would carry �Salmon� modules and 8 with the �Tench� type. All were allocated design code FE004M and the batch was numbered 640901 to 640922. Most wore the yellow livery common to Network Rail and LUL engineers wagons, although at least the first two came in GBRf blue. Another batch of FEA wagons was bought by Tube Lines subsidiary Trans Plant for use on the same renewal jobs. Tube Lines and Metronet were the two infrastructure maintenance companies that covered the LUL network. While Metronet was responsible for the lines that the work was being carried out on (mainly the Metropolitan and District), Tube Lines had responsibility for the provision of engineering trains. The 13 Trans Plant FEAs were delivered in the autumn with the numbers 640931 to 640943 and to design code FE008A. The yellow-liveried wagons were sent to Jarvis� York workshops for fitting out with �Slinger� Rail and Sleeper Delivery Train (RSDT) equipment, this taking until the following March. As modified, the design codes were changed to FE009A, B, C, D or E, depending on what equipment was fitted. The final development in the FEA story (for now at least) was the delivery in 2007 of a further four FEA-C wagons to GBRf, numbered 650051 to 650054. These were built to replace some crane runner wagons but in the event not used, and GBRf bought them to bolster their main fleet. Although all FEAs are basically container flats, the specialised modules and equipment fitted to some means that the FEA code covers a wide variety of types. This is in contrast to earlier practices whereby relatively minor differences would result in a new TOPS code being issued. With the FEAs, the use of the fourth letter AARKND is the only way to distinguish between the different types and indeed most of the wagons actually show all four letters. In early 2010 the Jarvis Fastline FEA-B wagons were sold to DRS. Links: Greenbrier webpage detailing their FEA. Includes a downloadable PDF with dimensions and diagrams. Astra Rail Industries webpage detailing their FEA. Includes dimensions and a rotatable 3D model. 16/03/2010: Info updated and photo of FEA-E added. FEA-B 640404 at Lewisham, 26th Feb 2008. Page added: 20/03/2008 Spotted an error? Got some additional info?